By review of Lean Impact: How to Innovate for Radically Greater Social Good by Ann Mei Chang. Available from Amazon here. 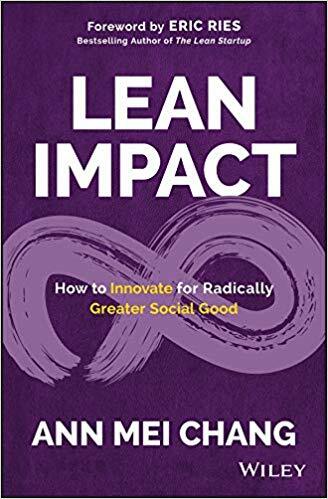 Inspired by the modern innovation practices, popularized by bestseller The Lean Startup, that have fueled technology breakthroughs touching every aspect of our lives, Lean Impact turns our attention to a new goal – radically greater social good. Social change is far more complicated than building a new app. It requires more listening, more care, and more stakeholders. To make a lasting difference, solutions must be embraced by beneficiaries, address root causes, and include an engine that can accelerate growth to reach the scale of the need. Lean Impact offers bold ideas to reach audacious goals through customer insight, rapid experimentation and iteration, and a relentless pursuit of impact. Ann Mei Chang brings a unique perspective from across sectors, from her years as a tech executive in Silicon Valley to her most recent experience as the Chief Innovation Officer at USAID. She vividly illustrates the book with real stories from interviews with over 200 organizations across the US and around the world. Whether you are a nonprofit, social enterprise, triple bottom line company, foundation, government agency, philanthropist, impact investor, or simply donate your time and money, Lean Impact is an essential guide to maximizing social impact and scale. At first we thought this was just another book looking to jump on the lean bandwagon. However when you consider the whole aid sector, and it’s many and large failures to effectively achieve change or success then a book like this actually makes complete sense. The author herself also intentionally pivoted from a tech career into the aid sector, at a predetermined time, and with the preconceived intention to leverage her tech and business insights for the benefit of helping humanity. Much like the Gates Foundation and it’s goals to engage with the lowest hanging fruit first in terms of diseases that kill people, and children particularly, by applying fresh business methods to development, so too Chang has aimed to do the same in her work. It is not always the case that tech can, or should solve all human issues. The need to not become a default technosolutionist is important. At the same time questioning the status quo, and looking for 10X improvements rather than 10%, incremental improvements can result in looking at hard, long existing problems in very different ways. Potentially with impressive and revolutionary results. Chang also had the, ultimately, fortunate experience of even working in the same company as Eric Ries before it crashed and failed, prior to his seminal Lean Startup book being written. This provided the invaluable learning experience of how big companies can make big mistakes in how they spend and develop their products. There are many smart elements to the Lean approach, and Chang has carefully considered how these are best adapted to the aid and development sector. The more of the book you read, the more you realise the potential for greater benefits is massive. In this context if you are working in the aid sector then this can be a really useful book for you to read.